My summer schedule is jammed packed with all sorts of crazy things but I still manage to find time to make a sweet treat every week. Since we eat dessert nearly every night I try to keep them on the healthier side. This week's dessert features peaches and yogurt, both of which taste delicious and are good for you. The added yogurt in the filling imparts a creamy tart taste which pairs nicely with the sweetness of the ripe peaches. Served warm with a scoop of homemade vanilla ice cream this makes a nice summertime treat for the family. To make the crust and topping, preheat oven to 350 degrees F. Grease an 8×8-inch baking pan. Combine the flour, sugar, and salt in the bowl of a stand mixer. Mix briefly to combine. Add the cold butter cubes to the flour mixture and mix on low speed until there are small pieces of butter evenly distributed throughout but the mixture is still crumbly. Reserve 1/2 cup of the mixture to use as the topping. Press the remaining mixture into the bottom of the pan, and bake for 12-15 minutes. Let cool for at least 10 minutes. For the filling, whisk the eggs in a large bowl, then whisk in the sugar, yogurt, flour, cinnamon, salt, and vanilla. 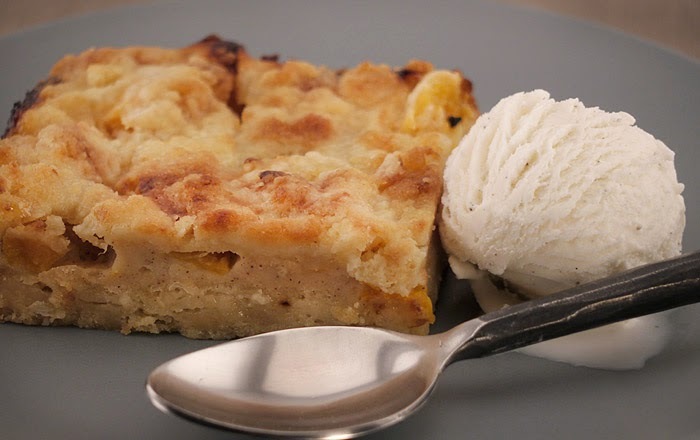 Gently fold in the peaches and spoon the mixture evenly over the crust. Sprinkle the remaining crust mixture evenly over the filling. Bake for 45 to 55 minutes. Cool at least 1 hour before cutting into bars. Serve with home made vanilla ice cream. These just look wonderful. I'm so glad we have a lot of ripe peaches at the market!! Just fantastic. I love the texture of this. I just love peaches. This looks so good. What a great recipe. Thank you for linking at the In and Out of the Kitchen Link Party. Hope to see you again next week. This recipe looks delicious. I love peaches in anything! !